"I alway's was a rebel...but on the other hand, I wanted to be loved and accepted...and not just be a loudmouth, lunatic, poet, musician. But I cannot be what I am not." If you would like your enrty added here please click onto the link below to find out how. Thank you all who have sent in your comments to be added. Always stop to dream and to 'imagine' sometime during the day. I was a Beatle fan since my early childhood in the early 70s. Everybody knew I was even down to the principal of my elementary school. When John was taken away from us that night, my Mom, Dad, and I were returning to Dayton OH (where we lived then) from visiting family in London, KY (where I live now) I woke the next morning to go back to school and Mom walked into my room and told me John had been killed. I would like to thank John for keeping me sane, for filling up my chilhood with memories that have allowed me to return again and again to that special place that only he and I and everyone who wanted to could go. He has bewildered, angered, and shocked me at times, but he has always been a fascinating character who dared to live as he chose, and changed us all in the process. The Beatles made me laugh immoderately, the way I used to laugh as a child...Their wit was just so keen and sharp-John Lennon's, especially. They all had this wonderful quality- it wasn't innocence, but everything was new to them. They were..finding out about the world and trying to make sense of it." ~ ? ? John was the one that started it all for us.He was always the inspiration to try new things and write what he felt and observed.But he was still a "Rocker" and would alwaysgive us a shot of Rock & Roll to remind us thats where his roots were. 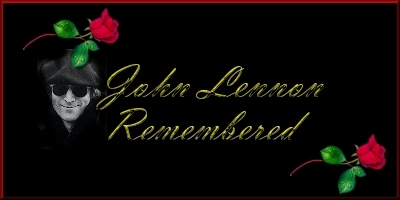 Although his solo material was "too heavy" for most people,thru his music he was one of the first to lead us in the worlds struggle for peace and the end of prejudiceses and violence.He was and still is a big influence in my life and to many of his contemperarys to this day!John's life was to short,but we still have his music and the music of the greatest Rock & Roll band that he brought together for all to cherish till the end of time! To continue through my site follow the links below.